The Escape v Newquay, Anglie: Zarezervujte nyní! The Escape Surf Lodge Newquay Cornwall is a lively Surf Lodge in the middle of Newquay, Cornwall, with wicked facilities and a really friendly vibe. We have 24 rooms of various sizes in bunk style, most with en-suite bathroom. The Escape is perfectly located close to all the main beaches. All the bars and clubs are within a couple of minutes walk. We are also only 100 metres from the town centre. We are 10 minutes drive from the Newquay airport, and a walking distance from the bus station and train station. Parking is free and wifi is available. 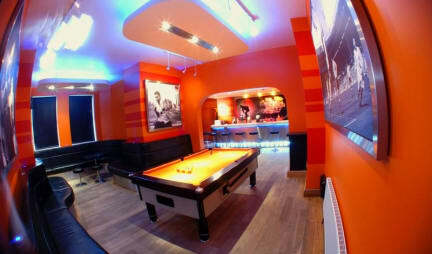 The bar is open from 8.30 am till 4 am and has a retro feel to it with a professional 3k Bose sound system and pool table. We also have an in-house Thai restaurant called 'The Bird' and Noam, Head Chef of the famous cooking school 'Time for Lime' in Koh Lanta, Thailand is back here for his sixth year. We serve breakfast from 8:30-11am. We offer activities such as surfing, Coasteering and go karting and we organise stag and hen packages as well. Payment upon arrival by cash, debit cards.